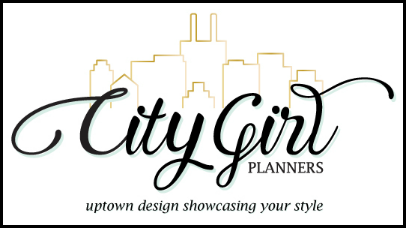 For the past five months, we've had some fabulous guest designers on the blog. for sharing your beautiful and inspiring creations with us. It's been a pleasure working together. they've created some gorgeous creations for New Year's. Such a great way to ring in the new year and wrap up a great GDT term. 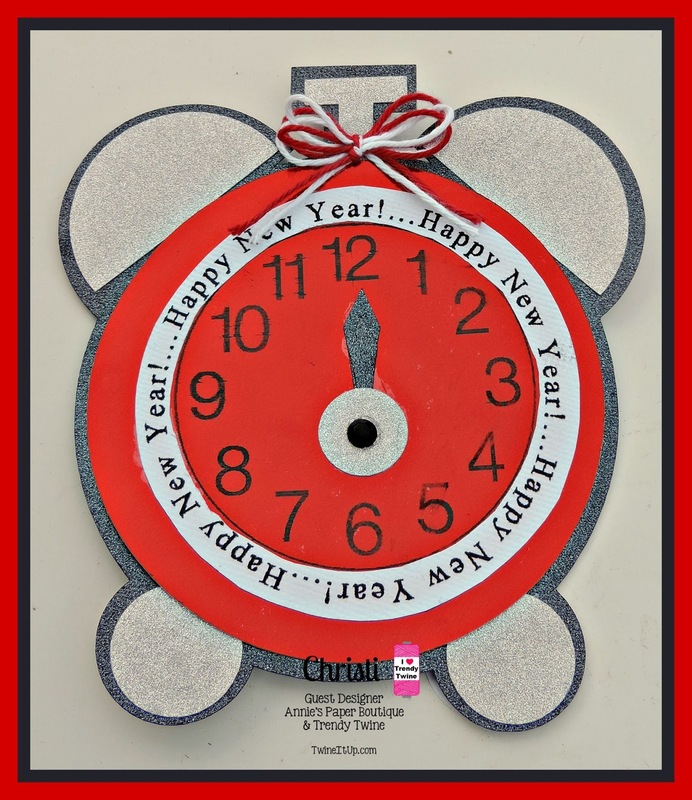 Be sure to visit each blog for all the details and leave some love while you are there. Also, I want to say a huge thank you to our amazing designers. 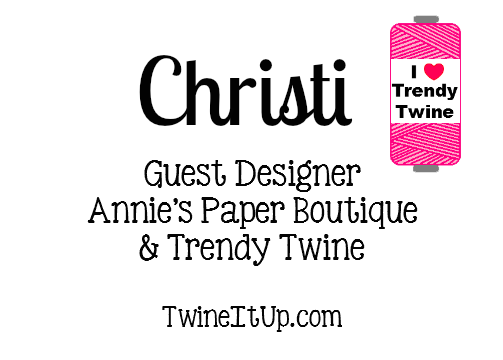 your creativeness and support for Annie's Paper Boutique and Trendy Twine. You totally rock and I appreciate you all so much! I sure hope everyone had a wonderful Christmas and was able to relax and enjoy time with family and friends. 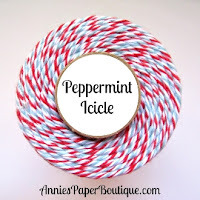 This is Shelly from My Paper Love sharing a fun winter gift using our spotlight color Peppermint Icicle Trendy Twine. 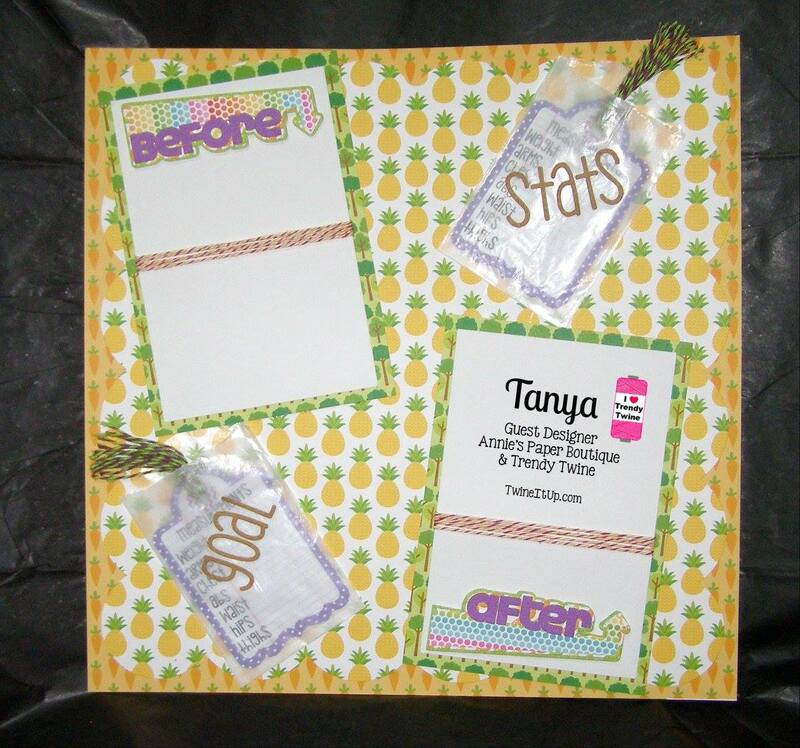 Have you used a APB kraft box? These boxes are so awesome the are so sturdy and easy to assemble. I used a 3x3x3 Kraft-Box and covered it with some fun winter paper. I used this cute box to wrap a pretty little homemade ornament. 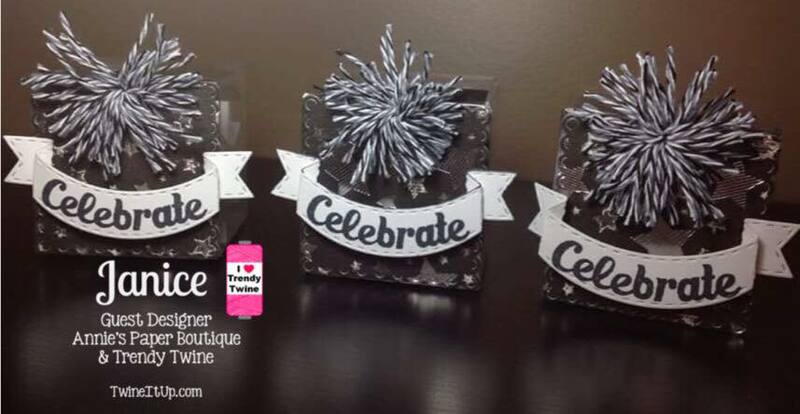 I added a fun winter wishes die cut and tied the box with Peppermint Icicle Trendy Twine. 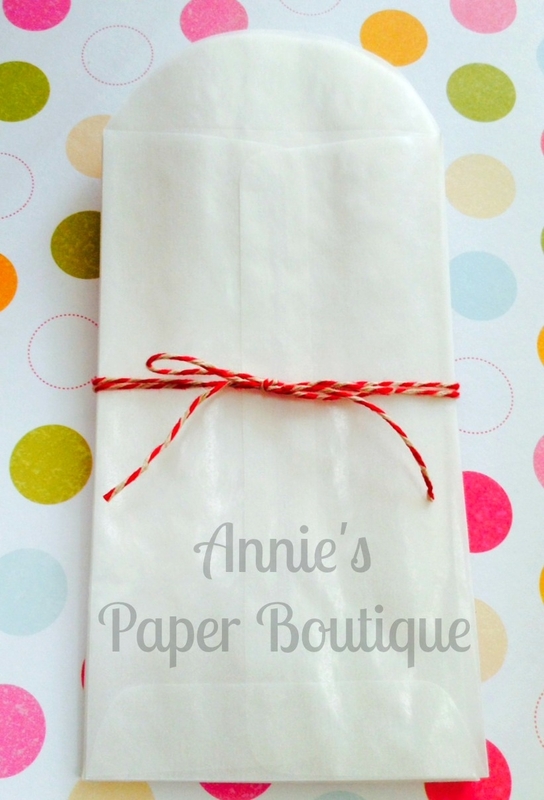 Such a simple but fun gift. Pop over to the APB store and grab yours today. Hello everyone! I'm Helen from HTB Creations. I always need thank you cards, especially around the holidays. 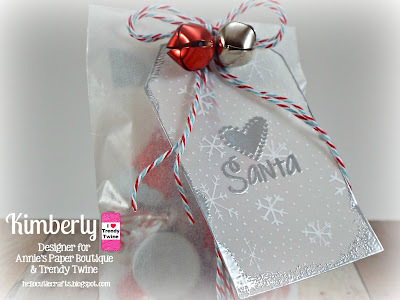 So I made one today with the Frosted Cranberry Trendy Twine, the Let It Snow Stamp Set, and a few Frosted Cranberry Sequins. 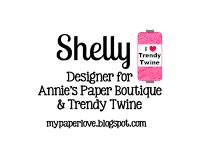 I added some Clear Wink of Stella to the snowflakes on the mittens and finished it off with the Frosted Cranberry Trendy Twine. to wish you a wonderful holiday. 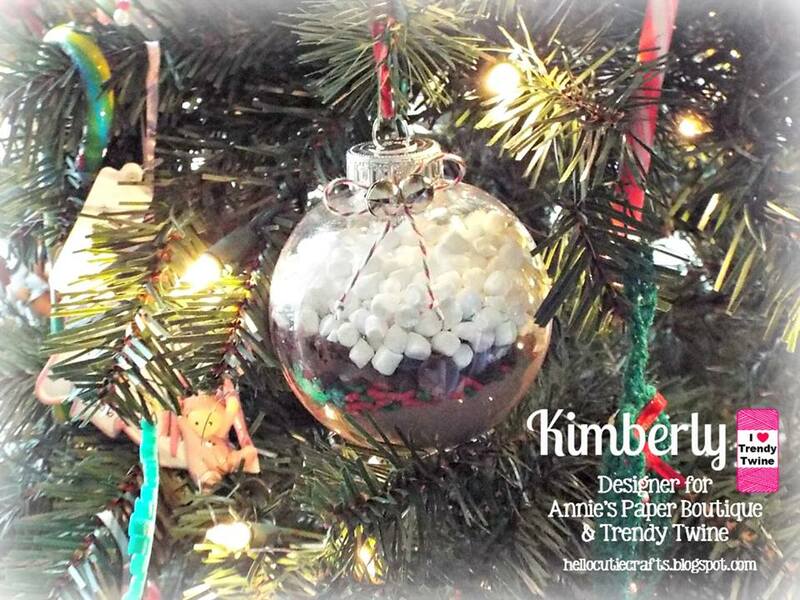 Kim's daughter, Bella, made this festive ornament. We hope you have a fabulous Christmas! Christi here from Scrapping for Tranquility! I want to share with you an adorable idea for a quick and easy Christmas decoration I came up with using my Frosted Cranberry Trendy Twine and Frosted Cranberry Sequins. round, triangle, foam form. 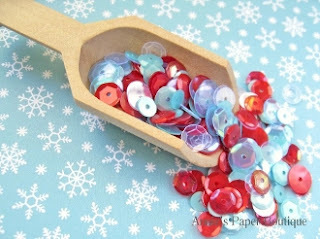 For the "ornaments" on the tree I used the Frosted Cranberry Sequins stuck on with pearl-head straight pins. To top the tree off I bought a gold star and painted it with blue acrylic paint and stuck it on top. I am really pleased how it turned out and hope you enjoy it also. 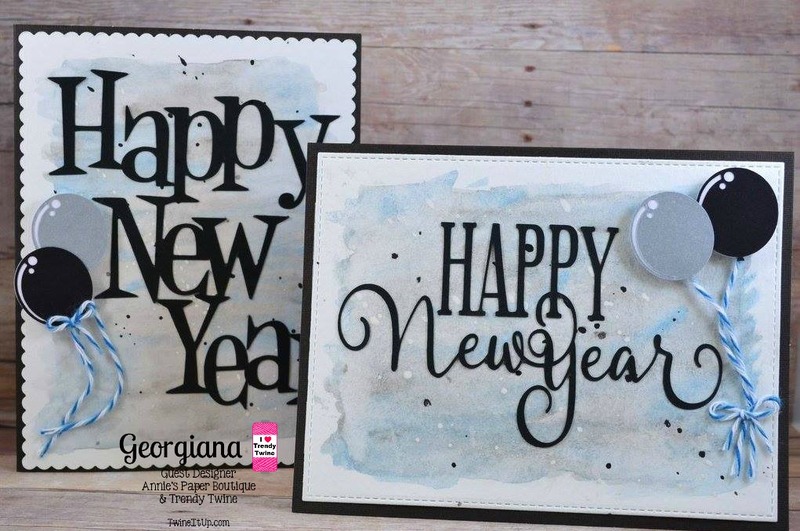 For more information stop over at my blog! I'm so excited, can you believe there are only two days left until Christmas? 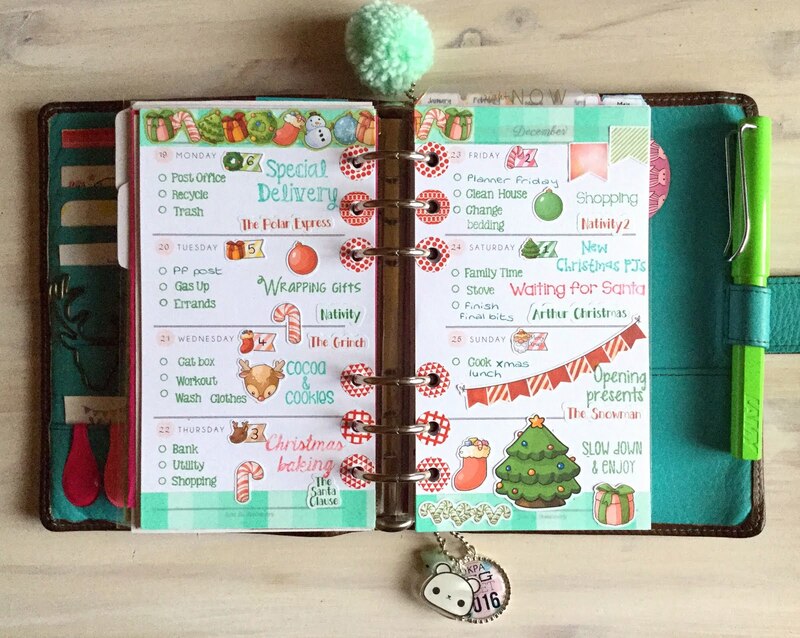 I'm on the blog today to share with you the planner pages I created using some fun festive stamps from Annie's Paper Boutique! Being Christmas week I don't have a lot of appointments or commitments to write down so I had some extra space to play with when I started decorating the pages. I used three sets of Christmas stamps to add some pretty reminders and these will also be great for when I document our holiday in my journal. 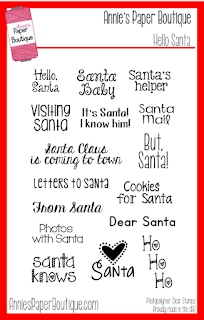 I absolutely love the New Christmas PJs stamp I have used on the 24th December as that is a tradition my mum started with me when I was little and I have carried it on with my children now too. 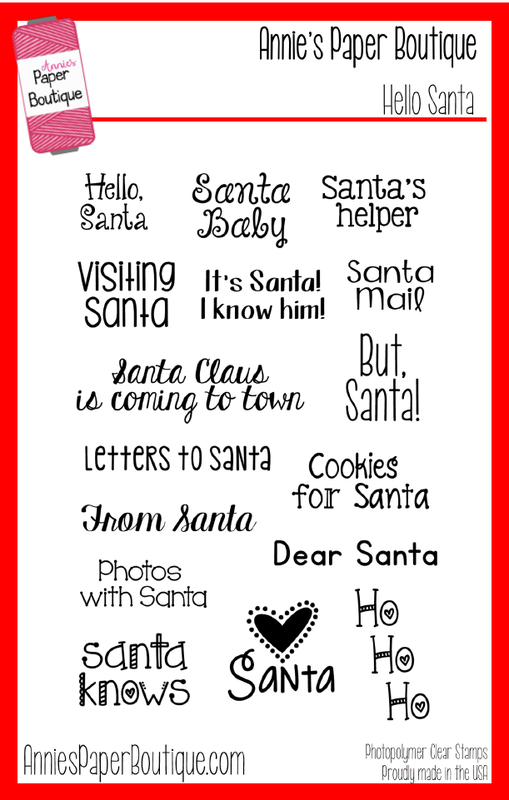 The Waiting for Santa stamp is a lot of fun as well, every Christmas Eve I take a photo of my three sitting on the sofa dressed in their new pyjamas and full of excitement and then we put our coats on, go outside and search the skies for signs of Santa's sleigh! Pairing the But, Santa! 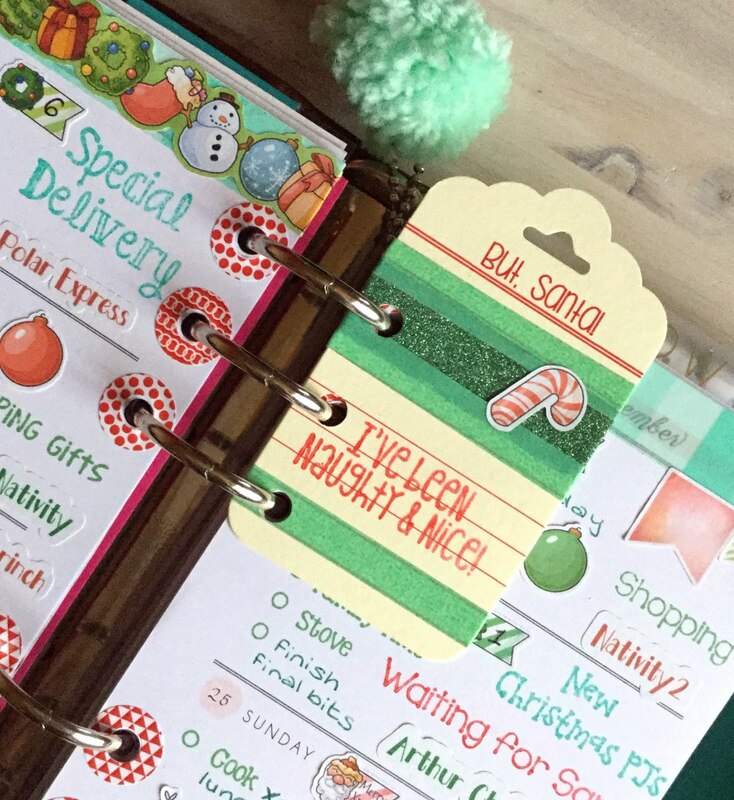 journaling tag with the I've been Naughty & Nice! 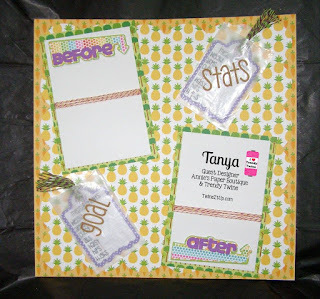 stamp made me giggle so I added a couple of strips of washi tape, punched some holes and turned it into a cute page marker. So that's my last post for 2016! 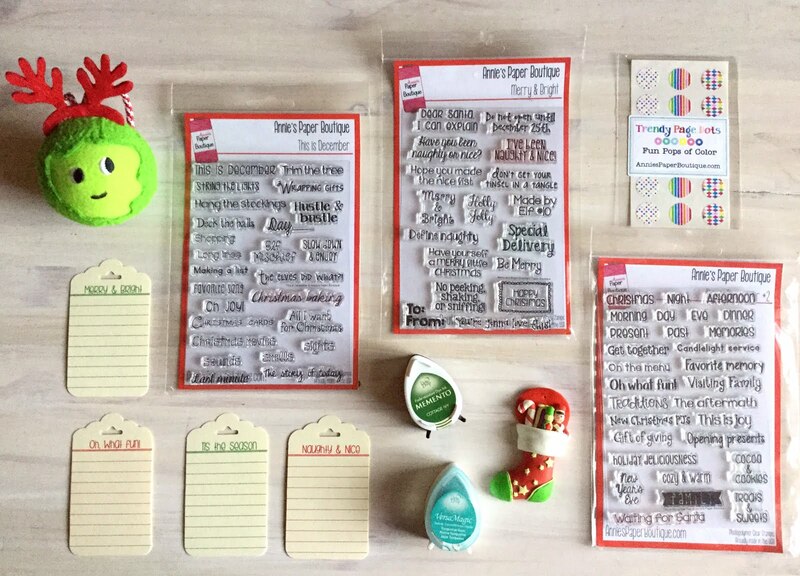 If you want to pretty up your planner in 2017 pop over to the store and take a look at all the lovely planning supplies and stamps, you should find everything you need to get you started. I wish you happy holidays and hope to see you again next year! 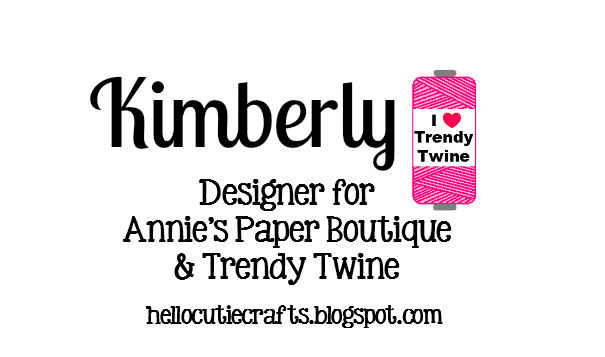 Trendy Twine - Be Merry! 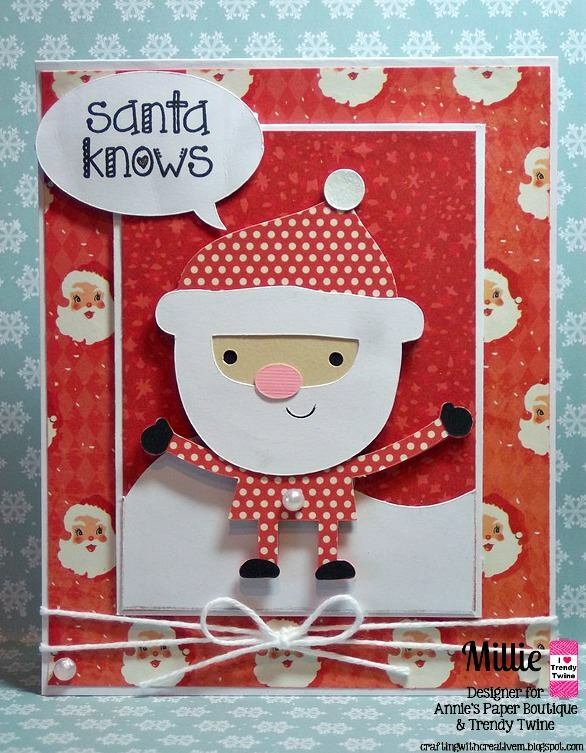 It's Millie from Crafting with Creative M! For my project I made a Shake card! I used Recollections - Christmas/Noel paper pad and the Happy Snowman from MKC. For the shaker portion I filled it with Peppermint Icicle Sequins. 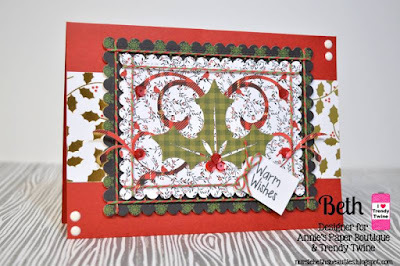 The "Be Merry" sentiment is from the "Merry & Bright" stamp set from APB. 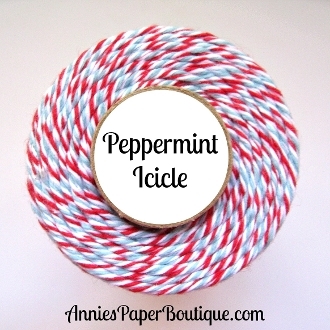 I added a pretty Peppermint Icicle Trendy Twine bow. 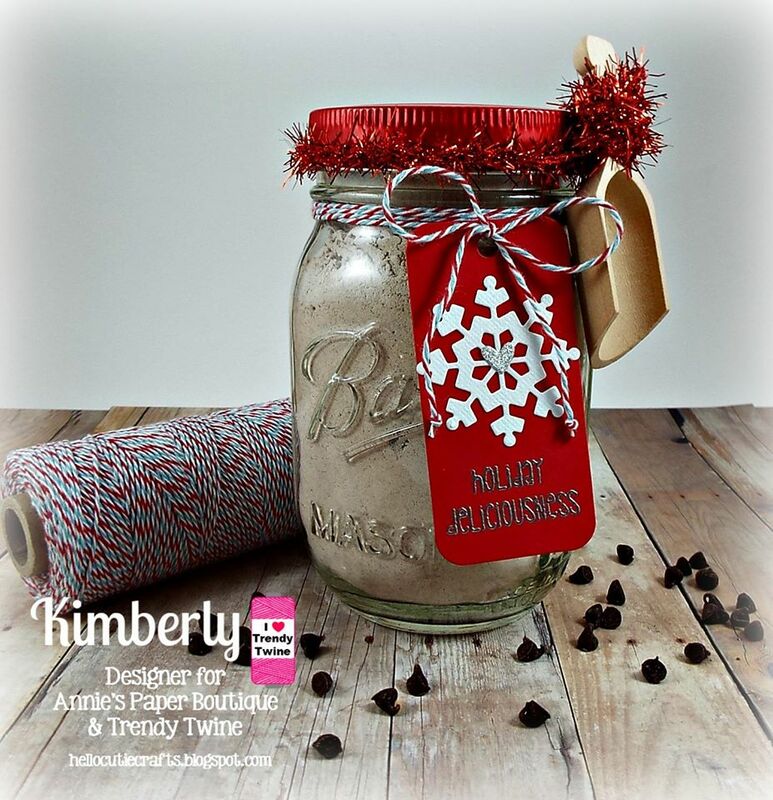 Kimberly from Kimberly's Crafty Spot here today to share a Christmas treat. For my treat bag, I used the Biggie Glassine Envelopes for the bag. 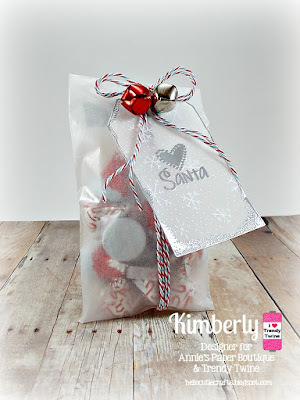 I added some hershey kisses to the bag and wrapped some Peppermint Icicle Trendy Twine around the bag. I heat embossed the Santa sentiment from the Hello Santa stamp set in silver on a vellum tag I picked up from the Target dollar spot. I tied the tag to the treat bag and added some jingle bells. Enjoy the Holidays and all the treat making! Hello! 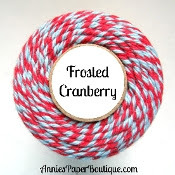 This is Sukie and today I have a layout page to share featuring some Frosted Cranberry Trendy Twine. I'm loving this festive twist of red and light blue, it is so fun for holiday creations. 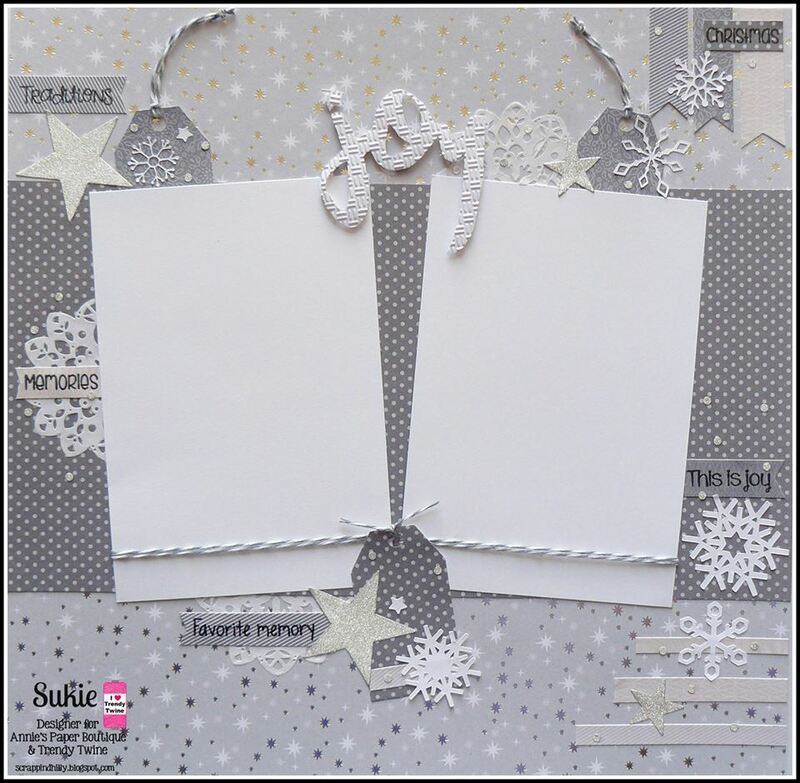 My layout page started with some festive paper from the DCWV Merry Little Christmas Stack which I have had for a couple of years. 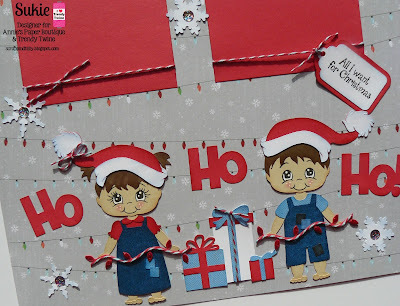 I used the adorable kids from the Peachkins SVG file from Peachy Keen Stamps and added a Santa hat to each of them. 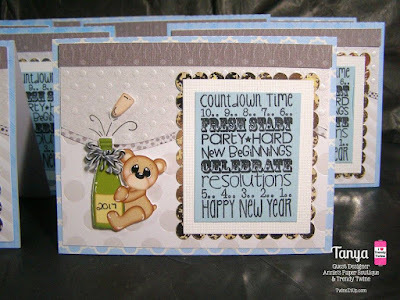 Their faces were stamped with the "In the Garden Babies" Peachy Keen Stamps. The title was cut from the Elmo and Friends Holiday cartridge and I added a string of lights to their hands cut from the Winter Frolic cartridge. 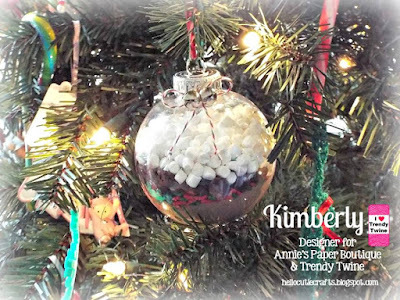 I used the twine to accent the string of lights, the set of gifts and the photo mats. A sentiment from the APB This is December stamp set was stamped on a tag tied to the photo mat. Head on over to the store to check out this gorgeous twine for those holiday projects along with all kinds of crafty goodies. Thanks so much for stopping by! Have a fabulous day! Do you want to build a snowman? I do! 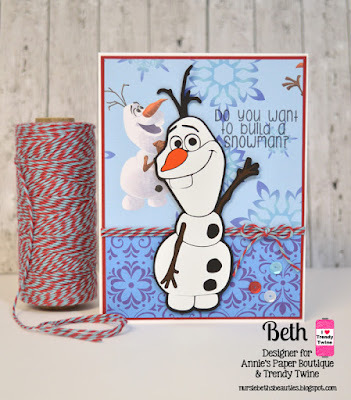 At least build one on a card ;) Beth from Beth's Beauties here with you today, and I have this Olaf card to share with you. 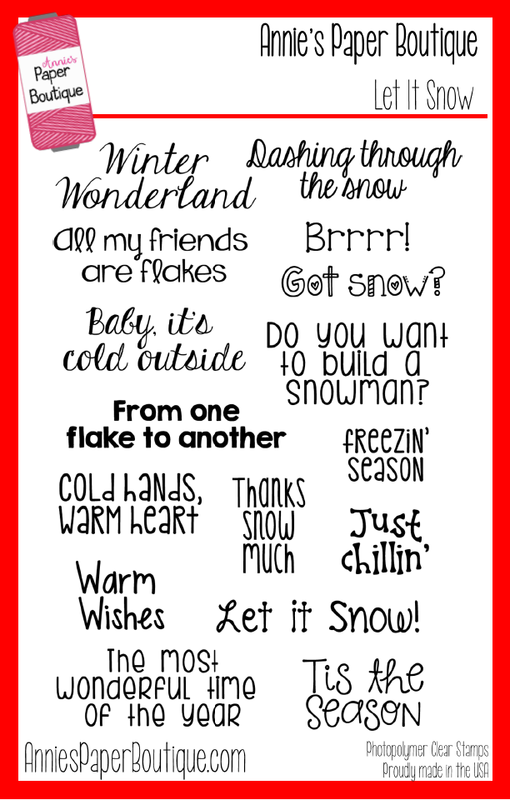 As soon as I saw that sentiment on the APB Let It Snow stamp set, I knew I had to make a card with the Frozen theme using it! 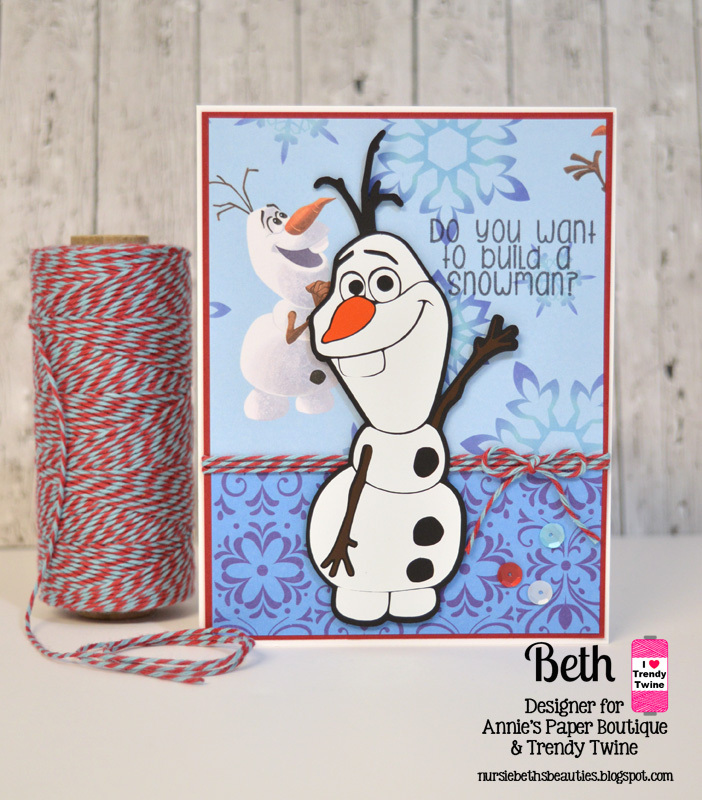 And when I saw a Frozen paper stack, it was a match made in Heaven! I used a trim of Frosted Cranberry Trendy Twine between the two patterned papers and added a bow on the right side. Three Peppermint Icicle Sequins were a great finishing touch! 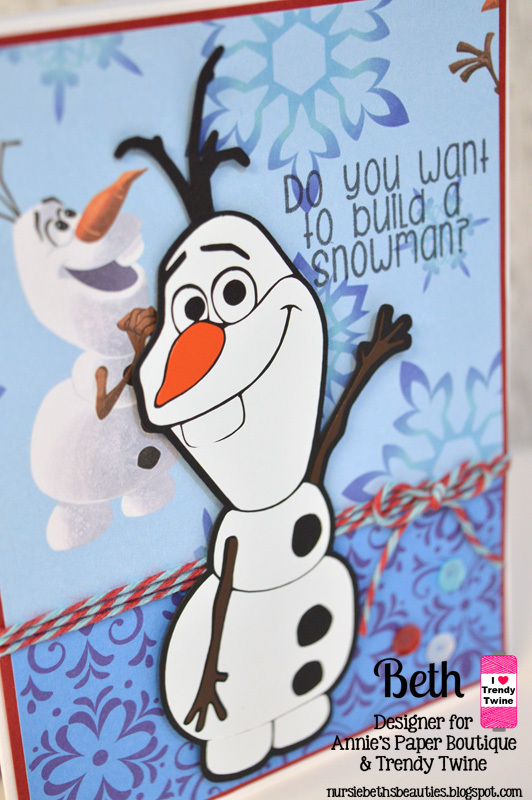 I cut Olaf from a free svg file using black cardstock as his base and vinyl for all the colors. For more details, on this card, stop by my blog, Beth's Beauties! Frosty the Snowman was a jolly happy soul! That is how I feel about my card I made for Trendy Twine this week! Hello! 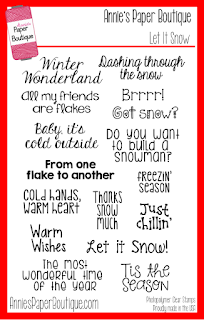 Christi from Scrappy For Tranquility here and I want you to think ....FROSTY....FROST......FROSTED...Yeah that is it! FROSTED!!! It all started with this adorable SVG Vintage snowman from Little Scraps of Heaven. I just adored him ! I thought what would look better with him but Frosted Cranberry Trendy Twine and this beautiful paper my dear friend Beth sent me? 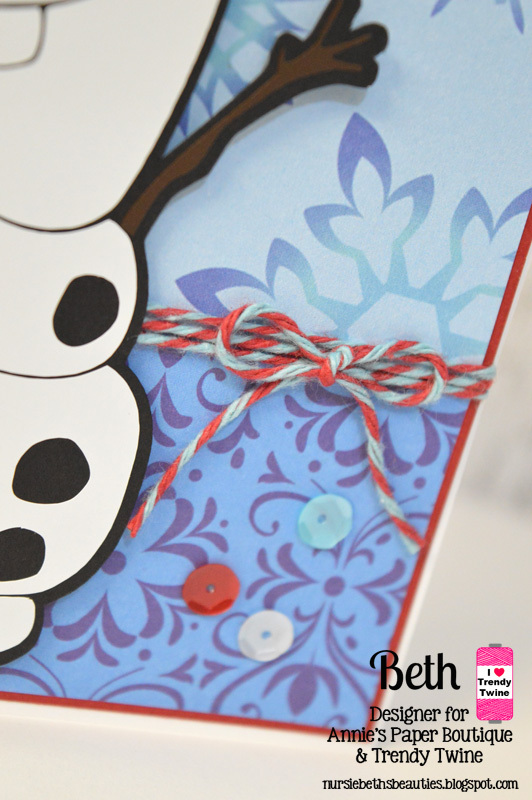 I then added the SVG of Frosty and slipped him behind the twine . 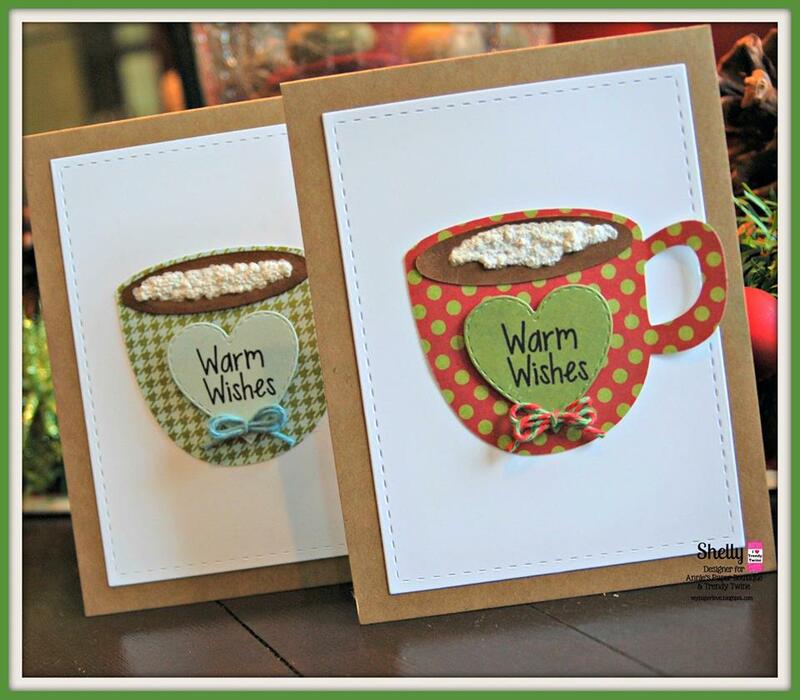 To top it off what better look than Frosted Cranberry Sequins that is a perfect ending to a Frosty.....Frosted......Song....I mean Card! LOL I added three to the top right corner of the card. 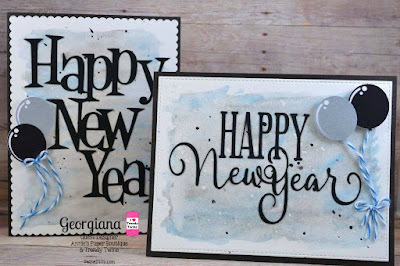 I would love it if you would stop by my blog and leave me some comments and I will respond back at: Scrapping For Tranquility! Thank you for joining me today! I would love to hear from you! Trendy Twine - Ho Ho Ho!